Immanuel Kant's Critique of Pure Reason, first published in 1781, is one of the landmarks of Western philosophy, a radical departure from everything that went before and an inescapable influence on all philosophy since its publication. This Companion is the first collective commentary on this work in English. The seventeen chapters have been written by an international team of scholars, including some of the best-known figures in the field as well as emerging younger talents. The first two chapters situate Kant's project against the background of continental rationalism and British empiricism, the dominant schools of early modern philosophy. Eleven chapters then expound and assess all the main arguments of the Critique. Finally, four chapters recount the enormous influence of the Critique on subsequent philosophical movements, including German Idealism and Neo-Kantianism, twentieth-century continental philosophy, and twentieth-century Anglo-American analytic philosophy. The book concludes with an extensive bibliography. Part I. The Background to the Critique: 1. Kant's Copernican turn and the rationalist tradition Desmond Hogan; 2. Kant, the empiricists, and the enterprise of deduction Kenneth P. Winkler; Part II. The Arguments of the Critique: 3. The introduction to the Critique: framing the question R. Lanier Anderson; 4. The Transcendental Aesthetic Lisa Shabel; 5. The deduction of categories: the Metaphysical and Transcendental Deductions Paul Guyer; 6. The system of principles Eric Watkins; 7. The refutation of idealism and the distinction between phenomena and noumena Dina Edmundts; 8. The ideas of pure reason Michael Rohlf; 9. The paralogisms of pure reason Julian Wuerth; 10. The antinomies of pure reason Allen Wood; 11. The ideal of pure reason Michelle Grier; 12. The appendix to the dialectic and the canon of pure reason: the positive role of reason Frederick Rauscher; 13. The Transcendental Doctrine of Method A. W. Moore; Part III. The Impact of the Critique: 14. The reception of the Critique of Pure Reason in German Idealism Rolf-Peter Horstmann; 15. The 'Transcendental Method': on the reception of the Critique of Pure Reason in neo-Kantianism Konstantin Pollok; 16. The Critique of Pure Reason and continental philosophy: Heidegger's interpretation of transcendental imagination Daniel Dahlstrom; 17. The Critique of Pure Reason and analytic philosophy Kenneth R. Westphal. 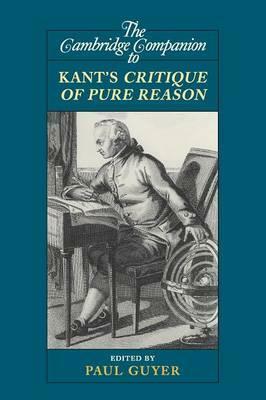 '... an excellent resource for any student of Kant. Classes centered on Kant's theoretical philosophy need but only two required texts: the Critique and this Companion. The isomorphic structure of the Companion renders it a superb supplement to the Critique, and I strongly recommend reading them in tandem. As such, the Companion provides a ready and useful tool for obtaining a substantial understanding of Kant's critical philosophy.' Alexander Bozzo, Kant-Studien "Whereas English readers once made do with only one modem translation and a handful of monographs, mostly stemming from positivist orientations, recent studies have shown greater facility with the original German, and with Enlightenment history in general. This Cambridge Companion is a splendid and much-anticipated addition to this trend ... it comprises a complete commentary on every major section of the Critique, along with five articles discussing its genesis and effect. Contributors include established names and younger scholars, all of whom display excellent facility with the original texts, and who position their impressive studies as though they were striving for depth of understanding rather than superiority of interpretative scheme. Both first-time students and advanced researchers will find this book indispensable for in-depth study of Kant's Critique ... Essential ..."
J. G. Moore, Choice "... an excellent resource for any student of Kant. Classes centered on Kant's theoretical philosophy need but only two required texts: the Critique and this Companion. The isomorphic structure of the Companion renders it a superb supplement to the Critique, and I strongly recommend reading them in tandem. As such, the Companion provides a ready and useful tool for obtaining a substantial understanding of Kant's critical philosophy." Paul Guyer is Professor of Philosophy and Florence R. C. Murray Professor in the Humanities at the University of Pennsylvania, where he has taught since 1982. He is the author or editor of fourteen previous books on Immanuel Kant, and co-general editor of the Cambridge Edition of the Works of Immanuel Kant, in which he has co-edited and co-translated the Critique of Pure Reason, the Critique of the Power of Judgment, and Notes and Fragments.